AM Update (11:00): More Mid Atlantic and Northeast rainfall records. Norfolk, VA. . . . . . . 2.77"
Richmond, VA . . . . . . 2.62"
Wallops Island, VA . . . 4.35"
These are all record-breaking amounts, as noted earlier. The totals for Norfolk and Wallops Island are only through 4 pm. The Richmond total is unofficial; if it's correct, it appears to break the all-time daily December record going back to 1887. The projected final total of 2.76" at Norfolk would also smash the all-time daily December record since 1871. November Warmer Than Average in U. S.
November temperatures were cooler than average across the Southeast and Central regions, and much warmer than average in the Southwest, Northwest and West regions. 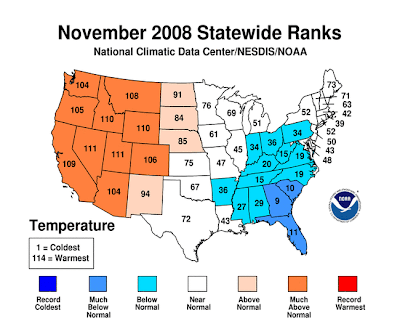 The West region had its fourth warmest November on record. This contrasted with the Southeast, which was much below normal. Persistent above-average temperatures for the last six months have resulted in a record warm June-November period for the West region. California set a record for its warmest June-November, while both Nevada and Utah had their fifth warmest June-November period. Based on NOAA's Residential Energy Demand Temperature Index, the contiguous U.S. temperature-related energy demand was 0.6 percent below average in November. The United States measured above-normal precipitation across the northern Great Plains from eastern Montana to western Minnesota. 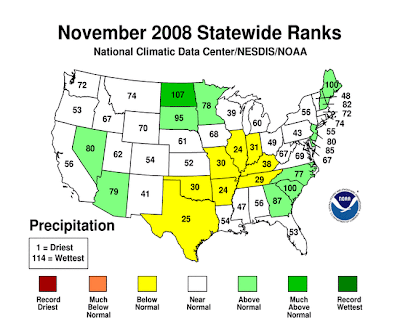 However, November was drier than normal across much of the South and Central regions. Precipitation across most of the Midwest was only 50-75 percent of normal and some areas from southern Missouri through central Illinois received less than 50 percent of normal precipitation. The January-November period has been persistently wet across much of the country from the central Plains to the Northeast. The 11-month period was the wettest on record for New Hampshire and Massachusetts, second wettest for Missouri, third wettest for Vermont and Illinois, and fifth wettest for Maine and Iowa. At the end of November, 22 percent of the contiguous United States was in moderate-to-exceptional drought, about the same as October. Meanwhile, extreme-to-exceptional drought conditions continued in the western Carolinas, northeast Georgia, eastern Tennessee, southern Texas, and Hawaii. About 26 percent of the contiguous United States was in moderately-to-extremely wet conditions at the end of November, according to the Palmer Index. This was a decrease of about three percent compared to October. 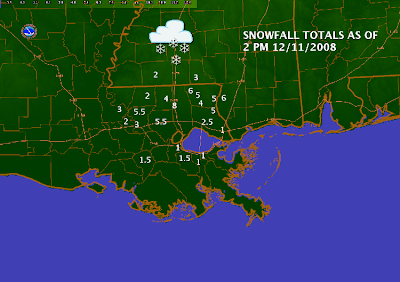 Dec. 14 update: Added snowfall map from National Weather Service, New Orleans. Portions of the Gulf Coast received an unusual early winter snowfall this morning. The noon radar from The Weather Channel shows the snow retreating into western and central Mississippi, leaving behind 1" of snow on the ground at Baton Rouge. 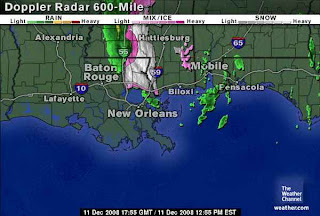 At 7 am this morning, Baton Rouge reported snow with thunder and a temperature of 34°. The winter weather forced a postponement of groundbreaking ceremonies for a Naval Meteorology Professional Development Center to be built in Gulfport, Mississippi. Weather Channel video is here.